These bonuses are not only for CS:GO fans, but anyone can take part of them and use them for any type of betting. There are no restrictions! To turn the received bonus money into withdrawable cash, a wagering requirement must, however, be fulfilled. Wagering required: 20x the received bonus on odds 1.75 or higher within 14 days. The code is valid as long as the tournament is running – until the 3rd of March and after activation it will last for 20 days. 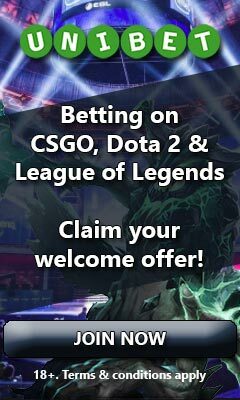 If you haven’t visited GGBET before, this is one of the best sites for eSports betting. They have a huge selection of games and matches, as well as several entertaining markets on many of these. You’ll also find some casino games to switch up the betting with, such as slots, table games and so called insta games. GGBET is also the home for a lot of live streaming, a 24/7 live chat support and regular campaign offers. Their website is well-structured and has a visually appealing look. As a new player you’ll also receive a 100% deposit bonus up to €50 by enterting the bonus code EBF50. If you’d like to know more about what to expect from this fantastic eSports bookie, you can read the full GGBET review here. Is investing in eSports a good idea?